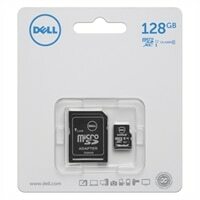 Dell 128GB Class 10 MicroSDXC Card with SD AdapterThe 128GB Class 10 microSDHC/microSDXC Class 10 UHS-I card features Class 10 UHS-I speeds of 45MB/s read and 10MB/s write, making it ideal for shooting images both in still and in motion. It’s also ideal for cinema-quality HD (1080p) video* and reduces buffer time between shots when compared to the Class 4 card. MicroSDHC/microSDXC Class 10 UHS-I is the standard expandable storage option for many tablets, smartphones and action cameras. It can also be used in conjunction with the optional SD card adapter for standard size SDHC/SDXC host devices. The 128GB Class 10 microSDHC/microSDXC Class 10 UHS-I card features Class 10 UHS-I speeds of 45MB/s read and 10MB/s write, making it ideal for shooting images both in still and in motion. It’s also ideal for cinema-quality HD (1080p) video* and reduces buffer time between shots when compared to the Class 4 card. MicroSDHC/microSDXC Class 10 UHS-I is the standard expandable storage option for many tablets, smartphones and action cameras. It can also be used in conjunction with the optional SD card adapter for standard size SDHC/SDXC host devices.